OPD released multiple videos of the shooting from police body cameras that recorded the killing of Joshua Pawlik. 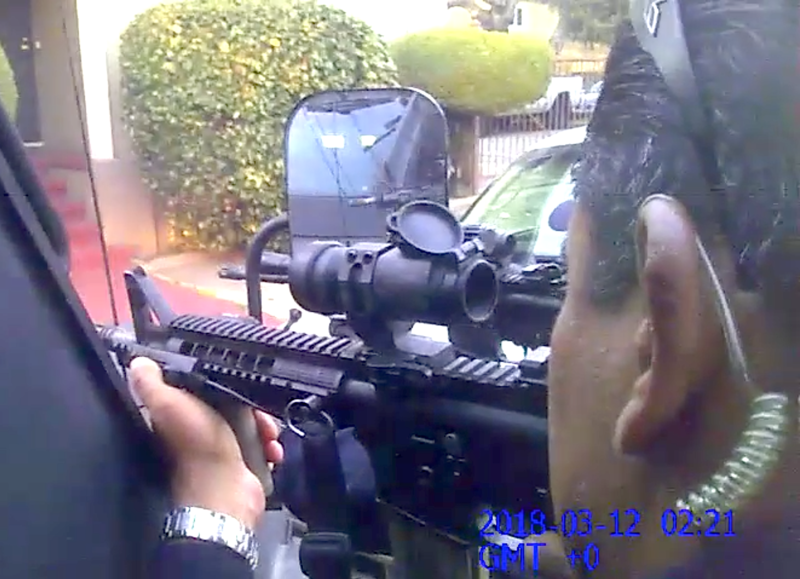 In a screenshot from a police body camera video, an OPD officer trains his rifle on Joshua Pawlik. Joshua Pawlik was shot by four Oakland police officers on March 11 after police responded to a call about an armed man lying unconscious between two West Oakland houses. Since the fatal shooting, little information has been made public about the incident, or the events leading up to it. But yesterday, OPD released multiple videos of the shooting from police body cameras that recorded the incident. Most of the body camera videos didn’t clearly record footage of the shooting because of camera angles and obstructions. But one unidentified officer thought ahead to remove the camera from their uniform and place it on top of the armored vehicle that police were using to shield themselves. This created a stable surface where it could continually film Pawlik and the moment of the shooting in detail. This video shows Pawlik lying unconscious between two houses. Just seconds after the police position their armored vehicle directly in front of the alleyway, Pawlik, who is laying on his right side facing the police, wakes up. He lifts his head as an officer shouts, "Don't move, get your hands up! Hands up!" Pawlik moves his head and shoulders slightly and slowly as the police order him to get his hands "off the gun." An officer yells, "Get your hand off that gun, young man!" Police repeatedly tell Pawlik to disarm himself as he appears to be waking up. One officer calls out orders in Spanish. One officer says, "That gun moves, bag him." In total, about 46 seconds pass between the time Pawlik wakes up and the final order is called out. At that point, Pawlik appears to rise to his elbow when multiple police officers open fire, several using AR-15 rifles. After the shooting, one officer says, "Goddammit." Pawlik’s mother, Kelly Pawlik, who has seen the videos, believes police over-reacted by surrounding her son at gunpoint while he was unconscious, and then shooting him while he was waking up. She alleges the officers provided him with no real chance to disarm himself. The police recovered a pistol from Pawlik, and it appeared to be in his hand when he was shot, but the videos recorded by the officers are somewhat hazy, and so it's not possible to clearly make out the gun. Pawlik was also carrying a large amount of cash and drugs in a bag. His close friends have told the Express that Pawlik wasn’t a violent person, and his possession of a gun was unusual. But Pawlik was also mentally ill and had spent much of his adult life homeless and addicted to heroin and other drugs. In a claim filed against the city in September, John Burris and Melissa Nold, attorneys for Kelly Pawlik, alleged that the police could have safely disarmed him because he was disoriented and not posing any danger to the officers. "Nevertheless, an armored, military grade vehicle was sent to the scene and multiple officers pointed AR-15 assault rifles at the unconscious man behind a bullet proof vehicle. Mr. Pawlik finally began to slowly regain consciousness and made some slight movement as he acclimated himself to his surroundings, prompting the officers to unleash a barrage of gunfire." According to OPD, there were eight officers who were involved in the incident. The four officers who shot Pawlik were named by OPD in March: Sgt. Francisco Negrete and officers William Berger, Brandon Hraiz, and Craig Tanaka. Also present when the shooting occurred was Sgt. Herbert Webber and officers Ty Hawkins, Josef Phillips, and Julie Yu. OPD provided all of their body camera videos to the Express through a Public Records Act request. The criminal investigation into the incident is concluded, OPD Officer Johnna Watson wrote in an email to the Express. Watson did not say what the outcome of the criminal investigation was. OPD's internal affairs investigation into whether any department policies were violated during the incident is ongoing. And the Alameda County District Attorney's office is also still reviewing the shooting to determine if the officers acted lawfully.